Zensible Mama: You Call this Ugly? 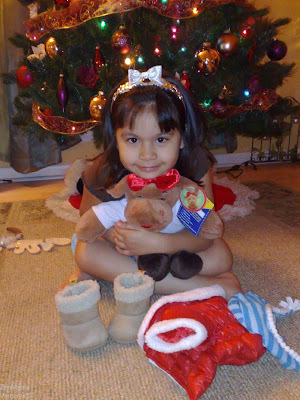 I was ecstatic when my daughter and I won Holly Moose and a $10 Build-a-Bear Workshop Gift Card during the BABW Twitter Party 2 weeks ago. I was quite overjoyed when I finally got Holly last week. I truly thought she was cute and adorable! But then there's this Ebenezer Scrooge of a guy who thinks otherwise. 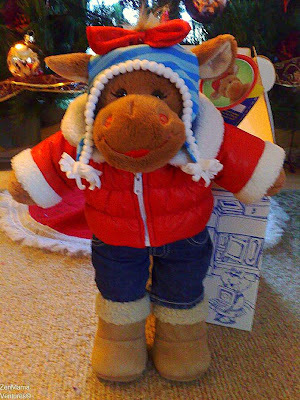 Seriously, would you honestly consider Build-a-Bear Workshop's new character Holly and Hal Moose plain ugly? I kid you not! This despicable nameless grinch guy actually think they are! Whaaatt thaaa??? yeah right? Who in their right mind would think they're ugly? They're Moose for crying out loud. How much cuter would someone want them to be - to NOT "look" ugly? Can you believe this guy!? I don't know what his problem is but I can't care less about what he thinks for if you ask me, I think they're cute and cuddly and I'll stick with that! Yes I know that we are all entitled to our own opinions but really, does it negate the need to be harsh to send a message across? Nonetheless, My 5 year old likewise agrees with me 100%. Is this evidence enough? I tell you, she never parted with Holly the minute she got hold of her! She doesn't go to sleep without her. She loves her to pieces and she thinks she's the cutest of them all. Now dare tell me Holly is ugly! *I bet you're wondering why I didn't include the link to the article. Simple. I don't want to give him link credits. But I'd be more than happy to point you where this article is if you want to read the entire story. You can send me an email or you can DM me at Twitter via @MaricrisG and I'll give you the link. I think Holly is adorable! Awwhh, too precious. Ugly is a dead word - there's no such thing.